The portrait of Steve Peters, former Speaker of the House, Legislative Assembly of Ontario was painted by Odon Wagner Contemporary represented artist Ron Kingswood. This portrait commission was unveiled on June 5, 2012. Ron Kingswood was chosen by the former Speaker Steve Peters (2007-2011) to paint a large oil on canvas portrait to be hung in the Legislative Building at Toronto. 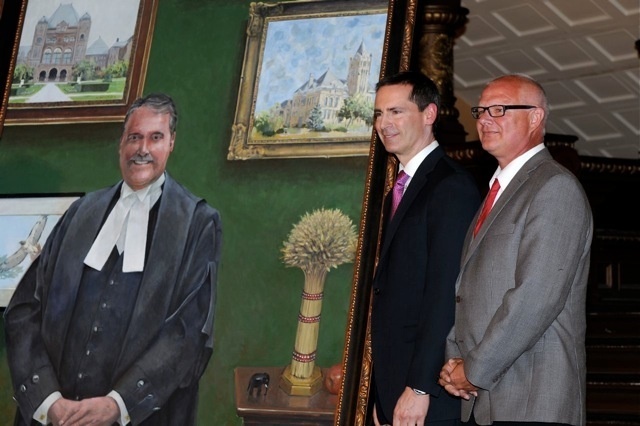 The unveiling in the Lobby of the Ontario Legislature was attended by the Honourable Dalton McGuinty, Premier of Ontario, the former Speaker Peters, the current Speaker Dave Levac, artist Ron Kingswood, many members of the provincial parliament and guests. We congratulate Ron Kingswood on this honour and artistic accomplishment.